Piano lessons in Toronto are available at ABC Academy of Music. Most parents instantly think of piano when considering lessons for children. Keyboard instruments are, without a doubt, an excellent way to lay a musical foundation. Treble and Bass clefs are both used, harmony is learnt at the same time as melody, a large range of sounds help to develop the ear, and excellent hand-eye coordination is developed (even feet are involved!). 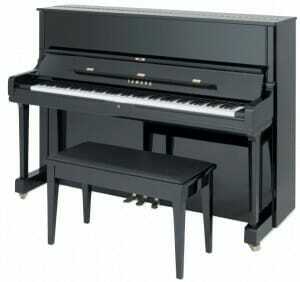 Piano and Keyboard instruments are extremely comprehensive in their offerings to an interested music student. Piano lessons are a popular traditional classical music choice for many people. Many students are also interested in popular music, jazz music, rock music, and more. Combining styles is a great way to promote and sustain younger students, and we are happy to encourage exploring these interests, while pairing it with the proven instructional methods (such as Alfred Basic Piano, Faber and Faber Piano Adventures, Leila Fletcher Piano Course, and Bastien Piano Basics) that have kept piano so popular with parents. Royal Conservatory of Music grades are also a popular course of study, and many students also challenge themselves by taking RCM examinations, which we delight in preparing with them. Adult piano students usually move forward faster than they would expect, as they can understand musical concepts more quickly, and put them into practice. Being an adult piano student can be very gratifying with consistent work and effort. Many of the same method writers popular with young students (Alfred, Faber and Faber, Leila Fletcher, and Bastien) offer Adult piano methods that allow a beginner adult piano student to move forward in a simple, yet effective way, with increasing difficulty. These adult piano methods also now come with CDs that provide examples for you to follow, and even play-along with. We have a lot of students, and take pride in offering Piano lessons in Toronto for Adults. For more information, visit our Adult Lessons page. The popularity of this instrument has led to the development of excellent Electric Pianos for home use that are both cost- and space-effective. If you make this choice, be sure to get an Piano with touch-sensitive, weighted keys. This will make sure your fingers will develop the proper ‘touch’ and strength on the keyboard so you will not get fatigued easily when sitting down at a real piano. These keyboards are available in a few sizes, but we recommend 70 or more keys. We can also help you prepare for University or College Piano auditions. We will be happy to recommend a reliable retailer to set you up with the correct instrument for you. Some retailers have excellent rental programs that are cost effective for electronic pianos, or even acoustic instruments, both uprights and grands.